Researchers from Brazil’s Paraíba State University have determined that extracts of pomegranate and chamomile can help heal bleeding gums. The study tested 56 patients who had bleeding gums and gingivitis. They were split into three groups and each rinsed twice daily with an assigned rinse for 15 days. One group rinsed with chamomile extract, another group rinsed with pomegranate extract and a third group rinsed with chlorhexidine. The patients were tested for bleeding gums at the beginning of the study, after seven days and after 15 days. The researchers found that all three extracts acted similarly and reduced gum bleeding significantly. The chamomile and pomegranate had antimicrobial effects, as they reduced harmful oral bacteria significantly. These included Streptococcus mitis and Streptococcus sangus, which are known to accumulate as biofilm and excrete toxins that produce inflammation, pain and bleeding. These same toxins can also leak into the blood stream where they can damage blood vessel walls, tissues and organs. Chamomile (Matricaria recutita Linn.) contains several flavonoids and terpenoids, which have been shown to be antimicrobial as well as reduce inflammation and spasms. Pomegranate (Punica granatum Linn. ), is also antimicrobial but it is also antioxidant and stimulates the immune system. These are typically attributed to its alkaloid content – including tannins. Pomegranate skin contains the most medicinal properties. Both the chamomile and pomegranate groups performed similarly to the conventional treatment chlorhexidine, reducing pathogenic and oral bacteria, ultimately easing bleeding gums. Further, the extracts were able to reduce Stroptococcus mitis and Streptococcus sangus, two bacteria known to accumulate and leak into the blood stream, damaging tissues, blood vessel walls, and organs through inflammation. The connection between gum disease and heart disease is widely accepted. In recent years, cardiologists have begun asking patients about their gum health and periodontists have begun inquiring about family history of heart disease. When compared with chlohexidine in the treatment of gingivitis, pomegranate and chamomile extracts could offer an additional benefit. This conventional antimicrobial doesn’t only eliminate troublesome bacteria, but “good” bacteria as well. By destroying the probiotics of the mouth, bad or pathogenic bacteria can return unchecked. 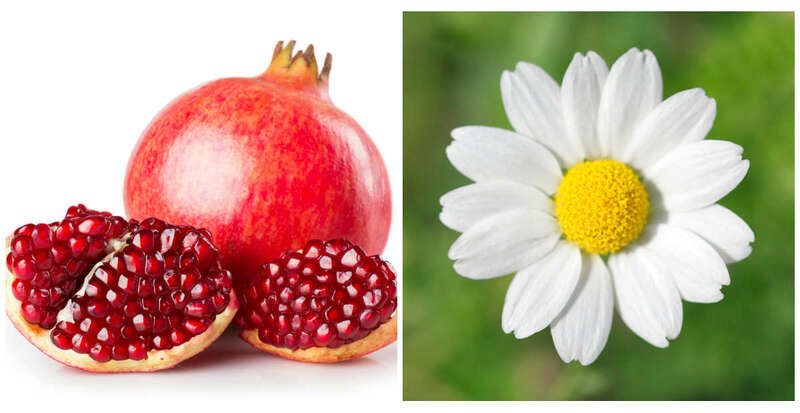 More research is needed to determine if pomegranate and chamomile have similar effects, but research suggests the majority of plant-based microbials are selective in their annihilation and support the regrowth of probiotics.